Over the past weekend, I attended and presented at the Rethinking Learning conference in Singapore. You can find the slides and resources from my presentation here. I attended a fantastic session hosted by Ophelia Cheung which outlined some of the fantastic educational tools and resources created by the NY Times and I felt compelled to write a blog post sharing what I learned. A large topic of discussion in the realm of education is the idea of fake news and the development of digital literacy skills. In her presentation, Ophelia Cheung outlined the meaning of News Literacy: which is the acquisition of critical thinking skills for analyzing and judging the news and information. The New York Times has ample resources and activities to promote the development of News Literacy skills. First and foremost, the NY Times website has a built-in text to text translator located above the title which allows readers to translate text into their language of origin to promote a better understanding of news articles. 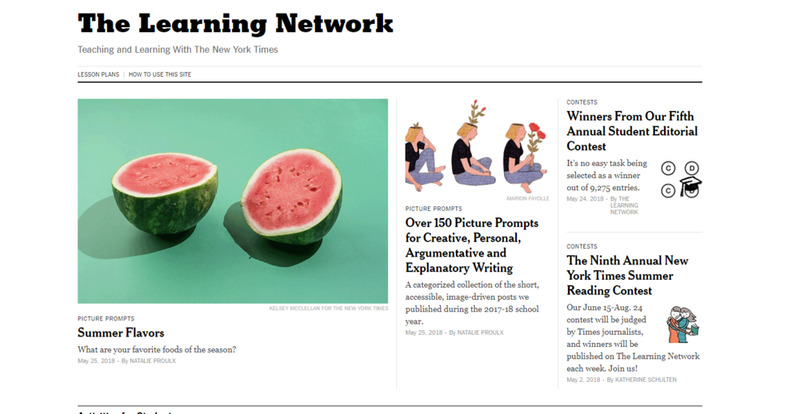 The New York Times Learning Network section of the NY Times has a variety of tools to help students develop analytical skills to better understand the news such as lesson plans, tips for use, articles and questions, writing prompts, quizzes and crosswords and a variety of multimedia. The NY Times also has a weekly column entitled What is Going on In This Picture which allows students to analyse photos without their caption to promote the development of visual literacy skills. It is incredibly important that students have authentic audiences for their work. This leads to deeper engagement and meaning in classroom activities. One of the ways the New York Times is helping with this is by providing students with an opportunity to enter their work in a variety of writing contests. You can find detailed information on the various contest with associated dates here. For additional ideas for incorporating the New York Times in the classroom check out this great article. Have you used any of the New York Times Educational resources in the classroom? Please comment below!